Greater Yellowspike is an epiphytic orchid 10-29 cm tall. Pseudobulbs are usually slightly compressed, ovoid to conic, 1-2 × 0.5-1.5 cm, with 2 or 3 nodes. Leaves are 3-5, narrowly oblong or narrowly ovate-lanceolate, 7-18 x 1.2-3.4 cm, base narrowed into a petiole and then decurrent into a sheath, apex obtuse or unequally shallowly 2-lobed. 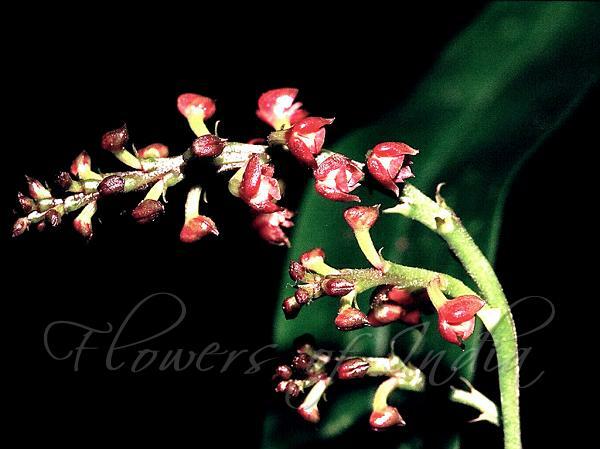 Flowers are borne at branch ends, in a 3-10 cm long cluster, usually 1-4-branched. Rachis is narrowly winged, racemose, branches 1-2 cm, 3-8-flowered; floral bracts narrowly lanceolate to nearly subulate, 2-5 mm. Flowers are pale yellow, small; flower-stalks and ovary 8-12 mm. Dorsal sepal subovate, 3.5-4 × 1.5-2 mm, obtuse; lateral sepals broadly ovate-triangular, ca. 4 mm wide at base. Petals are linear-oblanceolate or subcuneate, 2.5-3 × ca. 0.5 mm; lip 3.5-4 mm, base contracted into a short claw, 3-lobed; lateral lobes incurved, ovate-oblong to narrowly oblong, small; mid-lobe orbicular, margin undulate and irregularly erose, apex emarginate, with a thickened central part. Capsule ellipsoid, 1.2-1.4 cm × 5-6 mm. 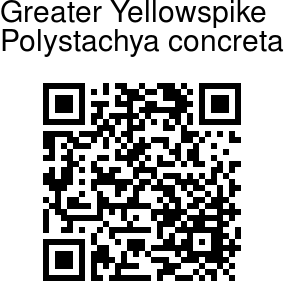 Greater Yellowspike is pan-continental species with a wide distribution. Flowering: August-September. Identification credit: Pankaj Kumar Photographed in Tamil Nadu.